White just subtle hints of color via off-white marble and natural wood, an all-white kitchen makes an impressive statement. White kitchens instantly make the space feel more open. Pops of color and earth-tone neutrals provide stylish accents to a white kitchen. Gold knobs and handles pop against clean white cabinets. Breaking up the clean white space with one wooden surface adds some dimension to the room. Bringing in color via décor makes even more of an impression when contrasted against the otherwise white kitchen. Even small kitchens get a lift of airiness in an all-white colorway. Natural wood and rattan detailing offer a subtle touch of color. A white marble backsplash infused with a gradation of color brings elegant dimension to the space. Breaking up a wall of white with subway tile or an off-white backsplash is a fresh approach to a white kitchen. 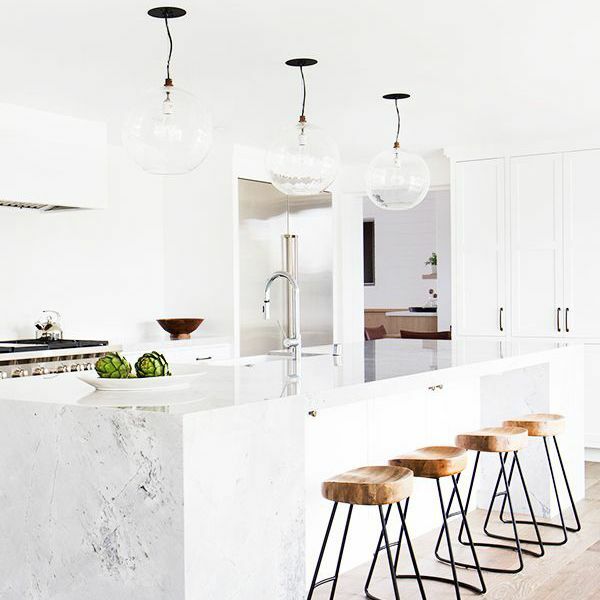 Statement lighting makes an even more striking impression in an all-white kitchen. Alternatively, a statement piece in lieu of hanging lights can become the centerpiece of the bright white space.